The Wright Memorial Bridge, which is the unofficial welcome to the Outer Banks for a majority of vacationers, has had a long and interesting lifespan that runs parallel to the history of tourism on the OBX. 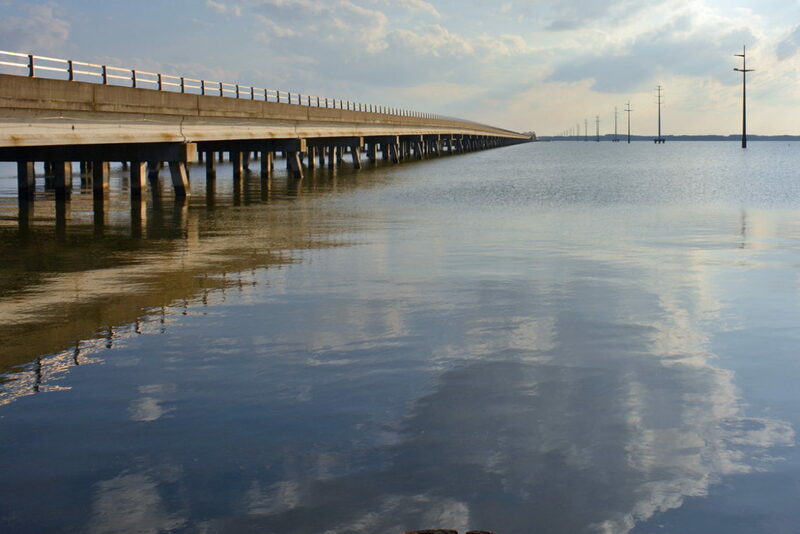 Originally opened in the 1930s to accommodate a handful of adventurous vacationers, today the Wright Memorial Bridge carries millions of travelers every year across the Albemarle Sound, and serves as the first glimpse of Outer Banks saltwater to visitors who are eager to begin their beach vacation. A relatively short route, (especially when companied to the neighboring 5.5 mile Virginia Dare Bridge which crosses across the Croatan Sound), this stretch is still considered one of the most scenic aspects of the drive for many long-time Outer Banks vacationers, with views spanning from the Currituck County Mainland to the Dare County town of Kitty Hawk. Dividing the two counties as well as serving as the approximate borders for the Albemarle and Currituck Sounds, the Wright Memorial Bridge is indeed a geographically important gateway, heralding the departure from the mainland and the official arrival to the barrier islands of the Outer Banks. As mentioned, the Wright Memorial Bridge spans the three mile gap of Albemarle Sound between mainland Currituck County and the barrier island beaches of Dare County. Located along US 158, the only 4 lane road that run the length of the northeasternNorth Carolina coastal corridor, virtually every visitors who travels to the Outer Banks from Virginia and all states north will cross over the bridge along their route. As Currituck County stretches south, travelers will notice that the terrain becomes more low-lying and coastal, with water on either side of US 158, and a handful of beach shops, property management companies, and other beachy attractions located throughout the area. On the Currituck borders of the bridge, visitors can make a quick stop at a local restaurant / convenience store before making the crossing, and on the other side, just past the "Welcome to Dare County" sign, visitors will notice a small collection of water sports rental businesses bordering the banks, with jet skiers, kayaks, and stand up paddle boarders skimming across the waters close by. It's a significant 3 mile crossing, to be sure, as one end is connected to the mainland, while the other drops visitors off at the edges of the Outer Banks barrier islands, and the differences between the two sides are palpable to every OBX traveler. Driving along US 158, the bridge is often a welcome site, as it indicates the departure from the rest of the world and the arrival to a beach vacation destination, (with a few minutes of scenery in between.) Making a straight cut across the sound to the borders of Kitty Hawk, the Wright Memorial Bridge is clearly the easiest, and most widely used, entrance to the Outer Banks. Before the series of bridges that lead to the Outer Banks were built, (including the Wright Memorial Bridge, the Manns Harbor Bridge, and the newly constructed in 2002 Virginia Dare Memorial Bridge), the area was sparingly accessed by a handful of privately owned and state subsidized ferries. Due to the islands' remoteness, the Outer Banks was a seldom visited vacation destination, and was traveled to by just a handful of rugged and wealthy hunters and vacationers up until the 1930s. But it was this elite initial band of clientele that led to the area's expansion, as word spread of the remote but beautiful beaches, and fancy beach cottages and hunting clubs were built all along the central and northern Outer Banks' coastlines. In fact, a line of these original early 1900s homes still stand along the oceanfront in Nags Head, affectionately referred to as "Millionaire's Row" as a nod to the first elite visitors who frequented the area. This notoriety was helped by the successful first flight of the Wright Brothers in 1903. After the national headlines declaring the first powered flight, the towns of Kitty Hawk and Kill Devil Hills suddenly became household names, and the entire central Outer Banks region was now a recognizable beach destination for families throughout the Northeast and Eastern Seaboard. As rumors spread around the eastern half of the country of the Outer Banks' gorgeous beaches, it soon became clear that easier roads and bridges would be needed to accommodate the growing number of visitors who wanted to see the area for themselves. As a result of this budding tourism, the Wright Memorial Bridge was commissioned in the early 1930s, (built by the appropriately named Wright Memorial Bridge Company), to close the gap between across the Albemarle Sound and provide an easy route from the Currituck County mainland to Kitty Hawk and the surrounding coastal towns. This first bridge looked absolutely nothing like the structure which straddles the sound today. Made entirely out of wood and resembling a boardwalk, the bridge was crossable at speed of 25 mph or less, but it still stood as an unofficial welcome center for visitors, with an arch stretching over the bridge's ending point on the Outer Banks, with "Dare County" painted boldly across the top, and the words "1583 Birthplace of a Nation" painted on the left hand pillar and "1903 Birthplace of Aviation" painted on the right. This bridge served as the entryway for visitors for 30 years, but in that time span, tourism to the area boomed, and thousands of vacationers were now flocking to the central Outer Banks region every summer to enjoy the beaches, restaurants, and all the attractions that make this destination uniquely special. By the time the Herbert C. Bonner Bridge was completed in 1962, opening up the southern regions of Hatteras Island to tourism, it had become abundantly clear that the meticulously maintained wooden structure would have to be updated. In 1966, the "new" Wright Memorial Bridge was opened. This two-lane structure was built out of concrete with concrete barriers and could withstand speeds of 55 mph, making it a safer and easier-to-travel gateway to the Outer Banks. Improvements and repairs were made over the ensuing decades, but for the most part, the solid concrete Wright Memorial Bridge was a vast improvement over the original, and handled the summertime traffic nicely. This all changed again in the late 1980s and early 1990s, however. At this juncture, more and more vacation homes were being constructed throughout all areas of the Outer Banks, from the northern beaches of Corolla and Duck to the southern towns along Hatteras Island, and the Wright Memorial Bridge was still serving as the gateway to all of these regions for northern visitors. This made the bridge prone to traffic jams in the summer months, and especially hazardous during hurricane evacuations when thousands of vehicles leaving the central and northern Outer Banks regions would be crowded onto the main two-lane bridge. A third and final renovation and rebuilding commenced in the early 1990s, and in 1995, the Wright Memorial Bridge reopened yet again, this time as a 4-lane, two bridge structure that could accommodate double the traffic as its predecessor. Since its opening, tourism on the Outer Banks has essentially reached its peak, and though tried by busy summer weekends and occasional evacuations, the current bridge has served as an effective and easy-to-travel route on and off the islands. While the hand painted "Birthplace of the Nation/ Birthplace of Aviation" arches are certainly long gone, visitors still get a kick out of seeing the brown metal "Welcome to Dare County" sign waiting for them at the other end, as well as the Aycock Brown Welcome center that's located just 1/3 mile away. A scenic and unofficial start to any beach vacation, the Wright Memorial Bridge still stands as a slightly larger, and slightly more used entry to the gorgeous beaches of the Outer Banks. One of the most common questions posed by Outer Banks vacationers is the status of the traffic on the Wright Memorial Bridge, especially on weekends. The answer is generally yes, there can be traffic jams along the Wright Memorial Bridge in the prime visiting seasons, especially in the summer months, and especially around the areas in Kitty Hawk that border the major shopping plazas on the outskirts of the island. The good news is that even on the busiest summer weekends, the traffic jams generally last 20 or 30 minutes at the most, and travelers who need a little relief from the road can simply roll down their windows and enjoy the fresh salt air coming off the Albemarle Sound. Visitors in a bit of a hurry who want to try and avoid the traffic jams altogether should avoid the Wright Memorial Bridge during the peak crossing times, generally from 12:00 p.m. until 4:00 p.m. on summer Saturdays on either side of the bridge. Considering that the majority of vacation homes on the Outer Banks are Saturday turnovers, this four hour time period is always the busiest, while virtually any other time of the week is a traffic free, speedy ride. Water lovers should make a stop at the handful of restaurants or activities that are located along the bridge's borders, especially the Currituck County side waterfront restaurants and the Outer Banks side jet ski rentals, parasailing trips, and kayaking rentals or excursions that are easily visible and accessible from the bridge. For an up-close view of the two bridge structure, any of these locales are a great place to relax and enjoy life on the water. While gas prices and grocery prices are generally the same on either side of the bridge, (despite the proclamations of some strategically placed billboards), the miles along Currituck County are a great place to pick up some fresh fruits and veggies before crossing onto the beaches. Keep your eyes out for roadside stands and farmers' markets, especially in the late summer and early fall months, and get a jump start on your grocery shopping with some locally grown "Inner Banks" produce. For a relatively indistinctive three mile bridge, the Wright Memorial Bridge has certainly garnered its fair share of attention over the decades, and today long-term visitors are still excited to see its entrance, knowing that in just a few minutes they'll be on the other side, and officially launching the beginning of a great Outer Banks vacation. Enjoy the open Albemarle Sound views, the bevvy of attractions and shops on either side, and the fresh salt air, regardless of traffic conditions. After all, in most seasoned vacationers' minds, once you hit the Wright Memorial Bridge, with seagulls stationed along the concrete borders and the Albemarle Sound waves lapping underneath, you are officially on island time, and beginning your OBX vacation. Corolla, North Carolina is a must see nautical village scented with the spray of the salty sea. It's located on NC Highway 12 along a thin strip of land bordered on the east by the tempestuous Atlantic Ocean, and on the west by the inland waterway of Currituck Sound. Corolla is home to the Currituck Beach Lighthouse, whose beacon first beckoned to sailors at sea in 1875, and to art noveau Whalehead in Historic Corolla, a turn of the century hunt club for sportsmen. The quaint village is also home to one of North Carolina's natural history gems called the Outer Banks Center for Wildlife Education. The center, which opened in 2006, is an impressive and marvelous 22,000 square foot interpretive center for young and old alike to explore the history and vast diversity of North Carolina's wildlife.